A set about three people deep and forty people wide, showing four living rooms that merged into one another with overlapping wallpaper. The top three-quarters of the backdrop grey and bare. It was difficult to suppress a sigh when five actors walked on in jeans and t-shirts and sat down lethargically on the authentic 19th-century Russian-looking furniture, looking like authentic 21st-century Germans. See my reviews of Das Schloss and Verkommenes Ufer at the Deutsches Theater for similar instances on stage now at a German theatre near you. The actors proceeded to give a little lesson on Pushkin’s affairs, low standards of personal hygiene in the 19th-century Russia, and the art of being a Dandy, complete with appropriate images from the period projected onto the blank half of the backdrop. Only then, the context fully established, did they begin to tell the story of Onegin in the form of third-person narration. Gradually, each actor changed into authentic dress of the period in full view of the audience, all of them requiring at least one, if not two, wardrobe assistants to help with the thigh-high socks, ankle-length underwear and corsets (worn by the men as well as the women) and many more complicated layers. A poetic rhythm did develop – albeit subject to occasional interruption by the historical background voice of the start, explaining the rules of a duel or the meaning of a particular bow at a ball. 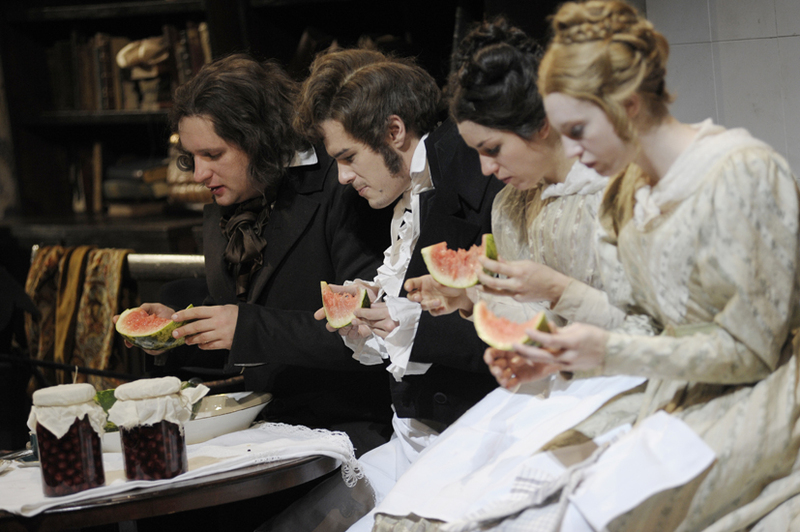 Hermanis gave the production a quirky humour with his direction, under which the characters acquired a penchant for dried flowers, frequently burying themselves beneath mountains of them, and for food: each of the two actresses spent a whole scene stuffing their faces, either attacking a watermelon with knives the length of her arms, or popping pickled cherries non-stop as Pushkin once did himself (so we are told) at a duel. In case you think that’s how the women were forced to get their kicks while the men were out shooting each other, you’re wrong: one of the actors informs us that duels between women were not uncommon either. This production was more like a fantasy version of my Russian History and Literature lectures at university than Tchaikovsky’s version of Onegin: it certainly wasn’t the pinnacle of drama and action, but it was entertaining and imaginative, and I learnt a lot without feeling patronized, ultimately gaining a deeper understanding of Pushkin’s novel. And there were projections of course – no lecture would be complete without those.